Microsoft has quietly released an update to Windows XP to fix a potentially serious configuration problem in the firewall that ships as part of Windows XP Service Pack 2 (SP2). High-speed Internet access may be coming to a flight near you. The FCC has voted to allow in-flight broadband, but is hesitating on green-lighting cell phone usage. I’m back at home recovering. I thought I was going to be awake trough the procedure since I was told I was being giving a local but I was out cold. Only thing I remember was being wheeled in the operating room and waking up in the recovery room a couple of hours later. Well i’m taking my pain meds and antibiotics and chilling while I catch up on my recorded shows on my Tivo. My wife had fun taking pictures at my expense in the hospital, here are a couple enjoy. Well guys wish me luck! I am heading out to the hospital now for my knee surgery. 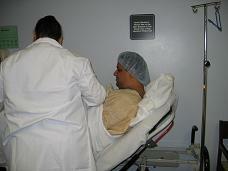 They are working on torn medial and lateral meniscuses, it is a short procedure but I will be in the hospital all day. I’ll give you an update when I am back from the hospital. Google the Fisher Price of desktop indexing? I just installed the beta of Microsoft Desktop search which is part of their newly updated toolbar suite. I have to tell you Microsoft’s version makes Google’s product look like the Fisher Price of desktop searching. The Microsoft product even in its beta stage is highly customizable and has a much more polished interface than Google’s version. Don’t take my word for it give it a spin, the link below will take you to the beta download page. In God we trust, at least we used too! What is this country coming too? America was founded on religious beliefs which are evident in every document drafted in behalf of the birth of this nation down to the money you carry in your pocket. The word God is posted every where, the declaration of independence, Constitution, Pledge of Allegiance and printed on the back of the dollar bill. God represents a higher being regardless of what religion you belong too. This country was founded by those who came here to avoid religious persecution. They didn’t want the same thing to happen here so they made sure that there would be a separation of church and government. So why now after almost 230 years do we have the problems that we are faced with now? America the great melting pot, when we had so many immigrants coming into the country with different backgrounds and religions why was it not a problem back then? Why now all of a sudden do we have a problem with the word God in the Pledge of Allegiance, a young girl using the word “God in a thanksgiving poem or a teacher being chastised for handing out excerpts from the Declaration of Independence that mention God in them. At what point does this end? I can see in not to near a future that churches will no longer be able to display nativity scenes outside their churches. They will have to be brought indoors as not to offend someone. Whether you like it or not this country was built on religion and advocated tolerance for all races and their religions not the exemption of it. We now see the religious majority being persecuted by the minority. Is this what this country has turned too? In my humble opinion if you cant deal with the word God in every document that created this country, the country that gives you the ability to become whatever you want to be with hard work, the country that protects you rights as an individual there’s the door, move to another country and don’t let the door hit you on your way out. Here are two links to some news articles, just to show you how far things are getting out of hand. I heard about these while I was driving in my car which prompted me to write this ranting. It’s been a bad year for me! It’s been a bad year for me medically. I just found out I need to have surgery on my knee for a torn medial meniscus. That just a couple of weeks after my belly button popping open for some unforeseen reason. That all comes after finding out that I have two herniated discs in my back and a fracture in my right foot. This all in the past couple of months and I started the year off with surgery for a torn rotator cuff. Talking about one screwed up year. I can’t wait for 2005 hopefully that will be a year of prosperity and good health. I least I hope and I pray it will be.